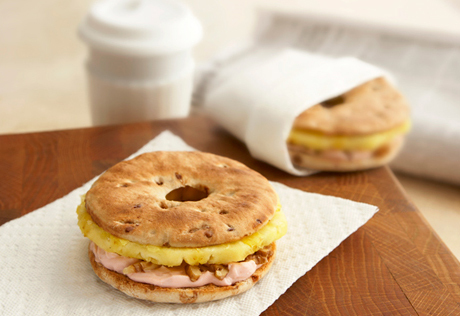 This breakfast on the go is far from boring...it features toasted bagels filled with strawberry cream cheese, pineapple and crunchy chopped walnuts. It's a great way to start the day. Spread 2 tablespoons cream cheese on each bottom bagel half. Sprinkle with the walnuts. Top with the pineapple slices and the top bagel halves. Use what's on hand: You can substitute 1/4 cup sliced bananas or fresh blueberries for the pineapple slices. For a more traditional spin: Try substituting regular cream cheese for the cream cheese with strawberries.